With all the stresses in life, members of the University of San Diego community can worry about one less problem and pee in peace around campus. 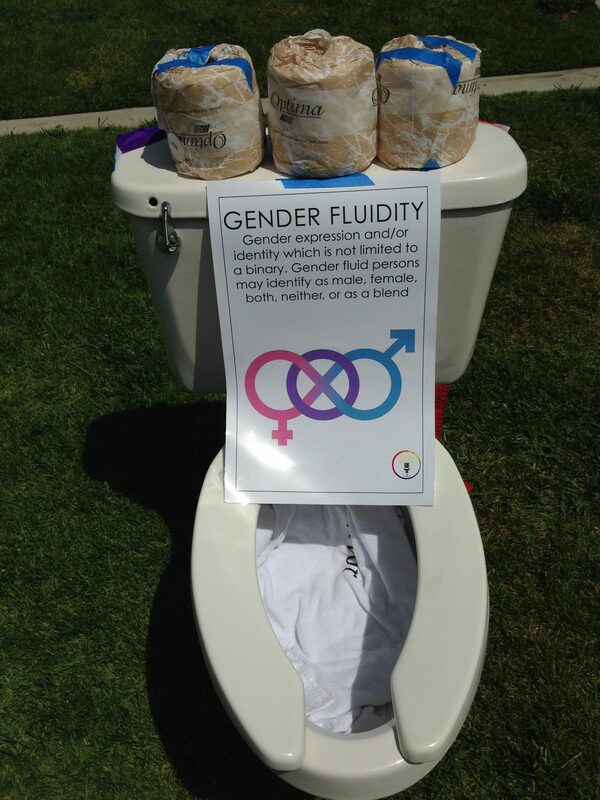 The Changemaker committee uses a toliet-toss game to teach the USD community about gender fluidity and gender-inclusive bathrooms. Starting in the fall of 2015, gender-inclusive bathrooms have been installed in various USD buildings. With seven on-campus locations including the Student Life Pavilion, Legal Research Center, and Student Health Center, gender-inclusive bathrooms provide single-stall bathrooms for persons of all genders to use. Senior Madeline Kasik is the president of PRIDE and on the Changemaker committee dedicated to spreading awareness about gender-inclusive bathrooms. Kasik was approached by Evelyn Kirkley, theology professor and PRIDE advisor, to apply for a Changemaker Hub core funding grant to educate the campus about gender-inclusive bathrooms. Kasik and her team are spreading awareness through tabling and the LBGTQ website. The website includes educational videos and resources about the bathrooms. The committee also has a map on the website that shows where the seven inclusive bathrooms are located. Kirkley works with the Changemaker committee to spread awareness about gender-inclusive bathrooms. “I’ve always been interested in furthering bathroom resources for gender fluid students,” Kirkley said. Although PRIDE does not have an official role in the project, Kirkley said that the Changemaker committee is a group of students, staff, and faculty that are invested in educating the campus about the bathrooms. Junior Marguerite Lehman works alongside Kasik and Kirkley on the committee. After working with the Women’s Center, Lehman talked with Kasik and got involved with the team to spread awareness. Lehman shared that the gender-inclusive bathrooms are for anyone to use. Despite the effort to spread awareness, not all students are aware of these resources. Sophomore Patrick Moore was shocked to learn that there were gender-inclusive bathrooms on campus. Moore said he thought he should have known about about the addition of the bathrooms, and expressed interest in them. First year Alexandra Smith-Farina was also unaware of the gender-inclusive bathrooms. “I’ve never really considered [the bathrooms] to be something that would actually happen, but I guess I’ll have to be more open to the idea,” Smith-Farina said. Whether the general student body is aware of this resource, the gender-inclusive bathrooms can provide a safe environment for all members of USD to pee in peace.